A certain coin is known to be unbalanced, in the sense of tending to favour landing more on the one side rather than the other. You don’t know which is the favoured side, nor how strong the tendency is. On the one hand, since, so far as you know, the coin is equally likely to favour landing heads as it is to favour landing tails, the only answer you can give is ½. 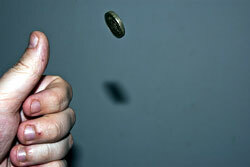 On the other hand, since you know that the coin is not balanced, the last answer you should give is ½.